At this point, each state across India remains affected by exacerbating levels of social or other forms of relational inequities which are assessable as per some performance standard. Over the last few decades the subject of rising social and economic aspects of inequality have been studied extensively in India. While discussions on standards of absolute poverty are often explained by different deterministic criteria (i.e. in terms of income, nutritional availability, access to basic amenities etc. ), benchmarks of assessing ‘relative’ dimensions of inequity remain subject to much wider deliberations and are a conceptual work in progress. At this point, each state across India remains affected by exacerbating levels of social or other forms of relational inequities (i.e. surfacing from differences of gender, caste/class based etc.) which are assessable as per some performance standard. In a recent study undertaken by the Centre for New Economics Studies, O.P. Jindal Global University, we made an attempt to gain a deeper understanding of drivers of social inequality across states in terms of their spatial access to social and economic services- illustrated by a new index – Social Equality Index. Access to Justice (i.e. via Public Institutions of Law Enforcement). 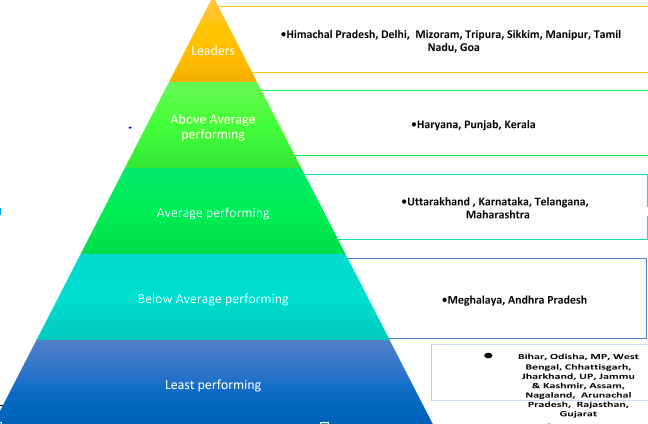 Each of the identified Indian states based on their index values are classified as leaders (index value of greater than 1); above-average performers (index value of 0.5 to 1); average performers (index value of 0 to 0.5), below average performers (index value of 0 to -0.5) and least performers (index value of less than -0.5). Such classification acts as a scorecard for demonstrating the persistence of social and economic inequality in terms of access to basic services across states. This article highlights some of the key findings from our results on state level performances as per the five pillars. To study ‘Access to Education’ at various levels in states across India, we used some of the following sub-indicators (for ranking states): a) Secondary schools at a distance of less than two km; b) Gross Enrolment Ratio in Secondary education; c) Gross Enrolment Ratio in Tertiary levels of education; d) Pupil -Teacher Ratio in Secondary educational institutions. Figure 1 below depicts the hierarchical standing of all major states in terms of access to secondary as well as tertiary educational institutions. With high literacy levels, Kerala, Himachal Pradesh, Goa and Delhi also perform better in terms of access to secondary and tertiary education and are categorised as leaders. In general, peninsular states (with the exception of Andhra Pradesh) outperform the ones in the hinterland, particularly on enrolment ratios in secondary education. The quintessentially worse-off states such as Jharkhand, Bihar, and Chhattisgarh etc. perform badly in the same indicator (access to secondary education), even though they seem to do well on enrolment ratio in primary schooling. Distance to school is an important determinant of the most persecuted section of the society. It has been a major factor in improving enrolment ratios and reducing drop-out rates amongst girls at different levels of education. The proximity of secondary schools is well above average in states like Delhi, Haryana, Punjab and lags behind in below performing states like Bihar, Madhya Pradesh and also in some hilly parts of Himachal Pradesh and Uttarakhand. There is a strong positive correlation seen in performance of states between this indicator and others, as states performing well in secondary education also did well in terms of improving access to tertiary levels of education (say, Tamil Nadu). According to National Sample Survey (NSS) 71st round, of the 10,00 schools, 973 secondary schools in Delhi and 843 schools in Mizoram are located at less than two km distance, with lowest in Arunachal Pradesh being 441. However, the number of secondary schools in above average and average performing states ranges between 650-850 schools. Similarly, the gross enrolment ratio in leading states is as high as 120 with least performing states having an enrolment rate of 66.8. Sikkim tops the enrolment in secondary education, followed by Mizoram, Himachal Pradesh, Goa, and Tripura. Kerala, on the other hand, has an enrolment ratio of 103. While the average performing states like Maharashtra has enrolment rate of 89.9 followed by Uttarakhand (85.72), Karnataka (83.22) and Telangana (82.53). All the BIMARU states (Bihar, Madhya Pradesh, Rajasthan and Uttar Pradesh) on the other hand, have an enrolment ratio below the all India average level of 25.53. Pupil-teacher ratio is another vital indicator which tells about how the average per-class teacher level across each state. A high pupil-teacher ratio suggests that each teacher has to be responsible for a large number of pupils. In other words, the higher the pupil/teacher ratio-the relative access of pupils to teachers remains low and is seen as counterproductive to learning. As per Unified District Information System for Education (UDISE)- PTR at a national level for elementary schools is 24:1 and for secondary schools it is 27:1 with poorer results in Bihar, Jharkhand and Uttar Pradesh where the pupil teacher ratio is high as 70:1. Successive state governments have failed to address their residents’ healthcare needs and affected healthcare outcomes for the vast majority of country population (see here for previous analysis). To capture state-level performance on access to basic healthcare services, we identified the following sub-indicators: a) Per capita availability of hospital beds; b) Per capita availability of doctors in government hospitals; c) Per capita availability of Referral transport; d) Per capita blood banks; e) Per capita availability of sub-divisional and district hospital in India; f) Percentage of children fully immunised. As can be seen in Figure 2, the leaders in providing basic health care services feature Himachal Pradesh, Uttarakhand, Mizoram, Sikkim and Goa. In Goa and Sikkim, about 88.4% and 83% of the children have received vaccination. Delhi – the above average performing state has about 24,000 hospital beds to serve its one crore population (as per 2011 national census data). The availability of government doctor is better in comparison with other states, while per capita availability of sub-district hospitals is 3.3 (national average being 4.6). 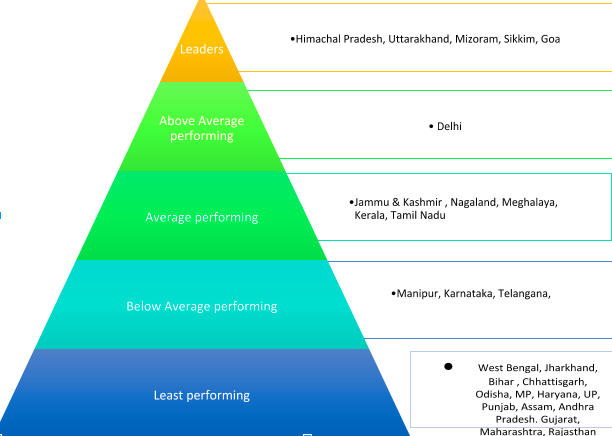 Jammu and Kashmir, Nagaland, Meghalaya, Kerala and Tamil Nadu are categorised as average performing states. The per capita availability of hospital beds in these states range as low as 0.08% in Tamil Nadu to as high as 0.11% in Kerala. Similarly, the availability of doctors varies from 0.01% in Tamil Nadu to 0.03% in Jammu and Kashmir. About 82% of the children have been covered under vaccination program in Kerala; however, only 35.7% of children have received the vaccination in Nagaland, under the immunisation programme. On per capita availability of blood banks, Kerala and Tamil Nadu do better in comparison to others categorised as leaders and above average performing states. Tamil Nadu also has better referral transport system compared to other states while Maharashtra performs best (in terms of ranking) on this indicator. Manipur, Karnataka and Telangana – the below performing states score abysmally low on per capita availability of sub-district hospitals. On an average, these three states together have only 65.5 % of the children have received vaccination. On per capita availability of blood banks and referral transport – Telangana and Karnataka score better than Manipur while the per capita availability of doctors in both these state remain 0.01%. Maharashtra on the other hand, is categorised as the least performing state (as per all sub-indicators). The state has only provided vaccination to only 56.3% of the children. The per capita availability of hospital beds is 0.04% and only 0.01% of total government doctors are available to serve the state population. Similarly, availability of government doctors and hospital beds are major concerns in these states including Andhra Pradesh and Punjab. Assam, Gujarat and Uttar Pradesh score very low on coverage of immunisation for children. Four sub-indicators were chosen to rank states based on their spatial access to drinking water and sanitation facilities: a) Percentage of a household having access to the main source of drinking water (Tap water from treated source); b) Location of drinking water source: within the premise; c) Location of drinking water source near premise; d) Swacchh Bharat Mission (SBM) Individual Household Latrine (IIHL) facility. Figure 3 below depicts Uttarakhand, Himachal Pradesh, Haryana, Delhi, Punjab, Kerala, Goa, Maharashtra, Gujarat are leaders in terms of providing access to water and sanitation facility to its people. According to census 2011 data, on an average, only 38.6% of households in India have access to drinking water from the treated source. As many as 55.9 % households of Haryana and 44.1 % of Punjab’s population have access to drinking water from treated source as compared to some of the below performing and least performing states. Similarly, almost 85.9 % of households in Punjab have drinking water facilities available within premise as compared to other states in India. Under the Swachh Bharat Mission (Grameen), sanitation coverage has been recorded 100% for states like Delhi, Kerala, Uttarakhand, Sikkim and Rajasthan. According to census 2011 data, the drinking water available to households from the treated source in Andhra Pradesh, Karnataka though higher than the all Indian average is relatively low compared to above average performing states. In terms of drinking water available within the premise, only 36% of households in Andhra Pradesh, 44.5% in Karnataka and 34.9% in Tamil Nadu have access to services, with the national average being 50.7% for India. 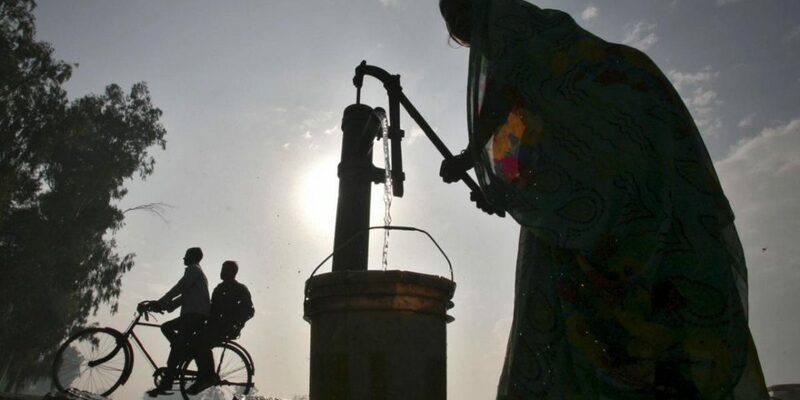 Households in Madhya Pradesh and Chhattisgarh, on the other hand, have very low access to drinking water from the treated source and drinking water available within the premise. Under SBM, only 53.6% households in Odisha, 63.4% households in Uttar Pradesh and 54.7% households in Bihar has been covered under the program. The northeastern states like Tripura, Mizoram, Meghalaya, Nagaland, Manipur though has better coverage under SBM program, their performance across all the other indicators are relatively poor. The drinking water available to the households from treated source range from 6.1% in Nagaland to 39.4% in Mizoram. Figures 4 and 5 below rank states as per their performance on Pillar IV (access to credit and financial institutions) and Pillar V (Access to Justice-Law Enforcing Institutions). The sub-indicators used for Pillar IV include: a) Percentage of households availing banking services; b) Per capita availability of ATM; c) Number of Schedule and Commercial Bank (SCB) accounts per capita. 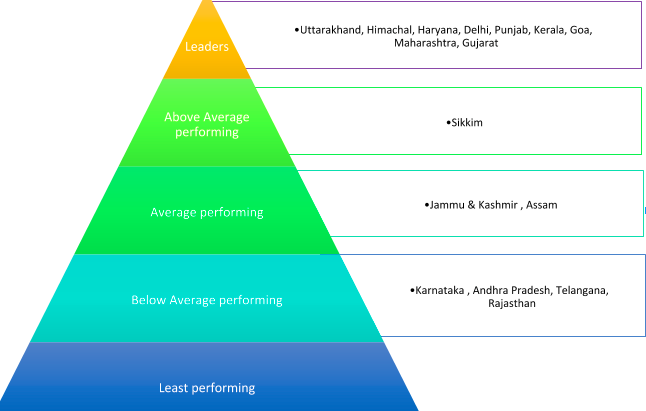 From Figure 4, Delhi, Uttarakhand, Himachal Pradesh, Kerala, and Goa rank as leaders. In Himachal Pradesh and Uttarakhand, the household availing banking services are 89.1% and 80.7 % respectively. 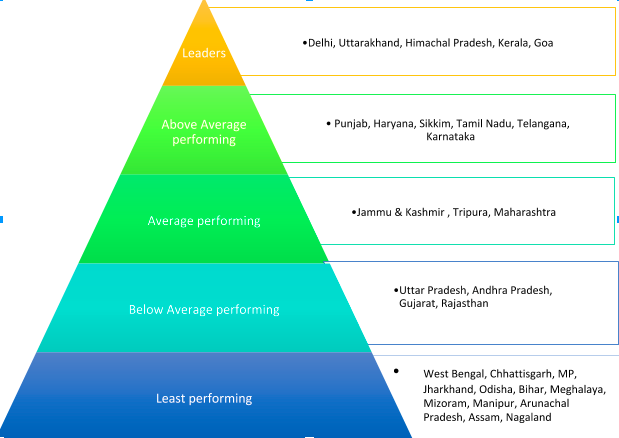 Punjab, Haryana, Sikkim, Karnataka, Telangana, Tamil Nadu are above performing states and Maharashtra, Tripura and Jammu & Kashmir are average performing states. The household availing banking services in Punjab (65.2%), Haryana (68.1%), Sikkim (67.5%) and Tripura (79.2%) is relatively higher compared to below average and least achiever states. Similarly, the per capita ATM and SCB accounts are relatively high in Haryana, Punjab, and Sikkim as compared to Gujarat, Uttar Pradesh and Rajasthan. On the other end of the spectrum, below average (Andhra Pradesh, Gujarat, Uttar Pradesh, Rajasthan) and least performing states consists primarily of north-eastern, eastern and a few of the northern states. 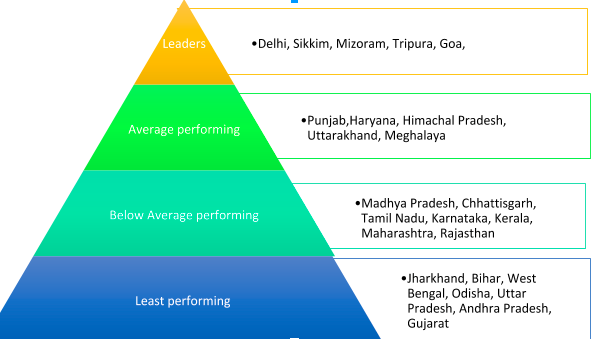 Madhya Pradesh and Chhattisgarh are also ranked as least performers in this category. Both in Andhra Pradesh and Gujarat household availing banking services are below the all India average level of 58.7 % according to census 2011 data. Similarly, Chhattisgarh and Madhya Pradesh have extremely low access to banking services for households; 48.8% and 46.6 %. The sub-indicators used for assessing Pillar V (access to justice) include: a) The ratio of pending cases resolved; b) Police per lakh population; c) Judges per lakh population. Due to the paucity of data, it was difficult to capture the spatial dimension of residents’ access to law enforcing institutions (i.e. police stations and courts). Hence, state population was used as a denominator to rank each state. Further, AFSPA (Armed Forces Special Powers Act) affected states are excluded from ranking in this category (due to heavy army presence). Figure 5 below reflects the overall ranks. From the Figure, leaders under access to justice are Delhi, Sikkim, Mizoram, Tripura (AFSPA was removed from Tripura in 2015) and Goa. The deployment of police in Sikkim and Mizoram is as high as 822 and 702 per lakh population. The percentage of pending cases resolved in these states is relatively high compared to other states categorised in different levels (On the basis of the levels categorised, this indicator doesn’t have above average performing states.). The working strength of judges in Delhi is 482 (as against 838 recommended by CJI). Similarly, for Goa is 43 (73), Himachal Pradesh is 148 (343) and Uttarakhand is 230 (506). On the other hand, states like Punjab, Haryana, Himachal Pradesh, Uttarakhand, Meghalaya (AFSPA was removed from Meghalaya in 2017) has showcased average performance under this pillar. Approximately 99.35 % pending cases in Himachal Pradesh and 99.1 % case in Uttarakhand has been resolved in 2017. The below average performing states include Madhya Pradesh, Chhattisgarh, Tamil Nadu, Karnataka, Kerala, Maharashtra, Rajasthan . Maharashtra and Chhattisgarh have resolved 98.18% and 98.53% cases respectively. Additionally, the police per lakh population available in Maharashtra are 186.5 and 228.6 in Chhattisgarh. Though the numbers are low, the states perform better in comparison to below average performing and least performing states. The police per lakh population in these states are relatively low compared to leader states and above average achiever states, with the availability of police in Tamil Nadu being 184.2 followed by Kerala (174.1), Karnataka (145.1), MP (125.4), and Rajasthan (121.7). The ratio of pending cases resolved is lowest in Gujarat; 98.04 and the state has 120.2 policemen available to cater to the need of the population. The judges per capita are also low in these states with Tamil Nadu having a shortage of 2699 judges followed by Karnataka, Gujarat and Kerala with 2081, 1898, 1219 as recommended by CJI. The availability of Police per lakh population in Andhra Pradesh is extremely low with 95.4 police personnel available. Similarly, Andhra Pradesh (including Telangana) lacks 3314 judges to meet the need of its population. Drivers of social and income inequality manifest in different forms and are subject to changes over time and space. The nature of drastic variations seen in the performance of each state across all pillars of assessment call for an urgent rethinking of policy-preference on areas such as healthcare, education, access to finance etc. A greater monitoring of district-level expenditures providing education, health care services and other basic amenities within each average, below average and least performing state is key in minimising the inequality of access within and across such states. Deepanshu Mohan is Assistant Professor of Economics, O.P. Jindal Global University & Director, Centre for New Economics Studies (CNES). Richa Sekhani is Researcher, ICRIER & Senior Research Analyst, CNES. Serene Vaid is Researcher, ICRIER & Research Analyst, CNES.